It's probably no surprise to most readers, who pick up Lifting the Curtain: The Disgrace We Call Urban High School Education by D. A. Russell, that there are problems in our cities' high schools. Media likes to blame the teachers and administrators, and often legislators create laws to try and "fix" the problem. 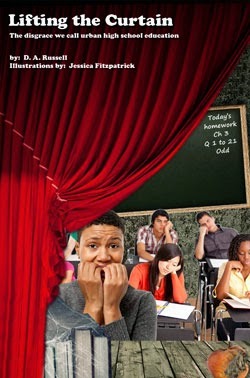 What's refreshing about Lifting the Curtain is Mr. Russell is an urban high school teacher. He is in the middle of the problem, and he has researched it. Even better, he's not just a whistle blower. He's created several workable and practical solutions to tackle the issues that plague our high schools. In the first 2/3 of the book, Russell explains why he writes about this issue as well as a survey he created for urban educators and high school students (and the results) and then eight systemic failures in the schools. The last third of the book is the solutions--there's not just one as he points out. It's not JUST the teachers, or ONLY parents, or THE administrators. The pages are adorned with illustrations from a tenth grade student, Jessica Fitzpatrick, who took Russell's stick figures and created cartoon-like drawings to capture his points. So what are some of these systemic failures that Russell sees from his own experiences and from studying the surveys? Here's just a sampling of his list: unqualified administrators, rampant cronyism, inclusion classes, special education hijacked by parents, burned out teachers, and teacher unions. Although you may or may not agree with each of his points, his passion for getting to the root of the problem and helping teenagers is all over these pages. One of his main points is right now, this is what is going on in our schools, and we are failing our kids. Shouldn't we shake things up a bit, change things around, to reach more teens and bring them success? This book makes me want to shout from the mountaintop... Yes! His solutions may also be controversial to some, but these are ideas you will see on blogs and in the news. Again, he is saying, "We need to do this. We need to change. Here's how we start." What I love is that he's not just pointing out the problem, and he's not targeting any one group as being wrong. His solutions range from fixing trust and integrity issues within the walls of the schools to allowing children to receive failing grades so they know they need to try harder, from focused professional development plans for teachers to make-up days for absences or truancy and more. If you believe in education and want to help urban students succeed, Lifting the Curtain is a book for you to check out. All educators would benefit from reading it, regardless of where or whom they teach. Mr. Russell is brave to tackle this emotional and tough topic, and he does so with grace and passion. Find out more about the book by visiting www.liftingthecurtain.com, the Lifting the Curtain blog, and the book's Facebook page. To win a copy of Lifting the Curtain: The Disgrace We Call Urban High School Education, please enter using the Rafflecopter form below. The giveaway contest closes September 29 at 12am EST. We will announce the winner the same day in the Rafflecopter widget. Good luck! Margo--I'd love to win this book. What's wrong with high school is probably what is wrong with ALL schools and ALL levels. Thanks for pointing out this book. I'll keep my fingers crossed. Sioux, there's a lot if truth to what you say! I know Don makes a statement like this in his book but he focused mostly on what he deals with everyday. In my opinion, this makes the book really authentic then! Thank you Ms. Dill for this review. What I appreciate most is that you focused not on the book, but about the message that we need to help our children! If the book is a good tool to get the message out, so be it. But there is far more good from just your review, and far more people are reached with your insights from the book about education, than any sale of a book could ever make. I know the views are controversial, and very hard to believe for non-teachers, or those who have not been in classrooms the past few years-- but my deep thanks to you and WoW for having the courage to share them. It's been many years since I was personally involved in the education system but as stakeholders in the future we are all involved whether just as taxpayers or as parents with kids in the system. It's great to see that some of the problems are being brought to light. I wish the author and his supporters all the best in their work.